ItemL.21199 - White church with a red roof and red trim that has a small sign on the front that says: "San Carlos"
Colour Ektachrome 35mm slide depicts Dr. Irving Snider and two other unknown men sitting on chairs. Two of the chairs are chaise lounges and have blue cushions on them. 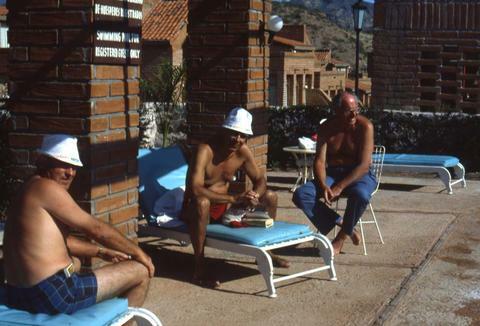 There is a sign on a brick pillar that says: De Huespeded Registrados, Swimming Pool for Registered Guests Only".